You sod an piece of ground. Here you fire a light on. This you extinguish with e.g. moist bark or hay. Then you stack the also with some dry hay -filled pots, stable, opening down. Around the pots you pile wood. (Like when making charcoal and firing bricks.) Which is covered with sod. Via an air supply and a chimney you can give some times oxygen to the fire. Then you cover them off too. Allow the oven to burn and cool completely. Often, about half of the content will fail. t is also possible to bake biscuit first in an open fire, and only then to accumulate timber and turf. 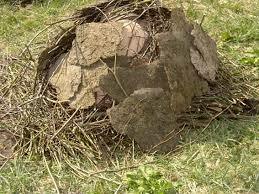 You can temper direct heating and cooling by placing dry cow manure around the pots and stacking the wood against it. In a sawdust kiln you stack the pots filled with sawdust, in sawdust. You make a fire on top of it to light, and let him quietly, until one day burn out to the bottom. If you put wire mesh between the pots they do not fall down. steam is formed, and must be slowly heated further. Between 450 and 800 degrees also chemically bound water is expelled. Around 600⁰C clay glows and compacts. Above 850⁰C is: the hotter, the more solid and watertight clay becomes by glass molding or sintering. Depending on the size and thickness of the pieces they are fired 8 to 15 hours, and it takes twice as long to cool. How can you keep quite some money as a potter? Start with a lot.